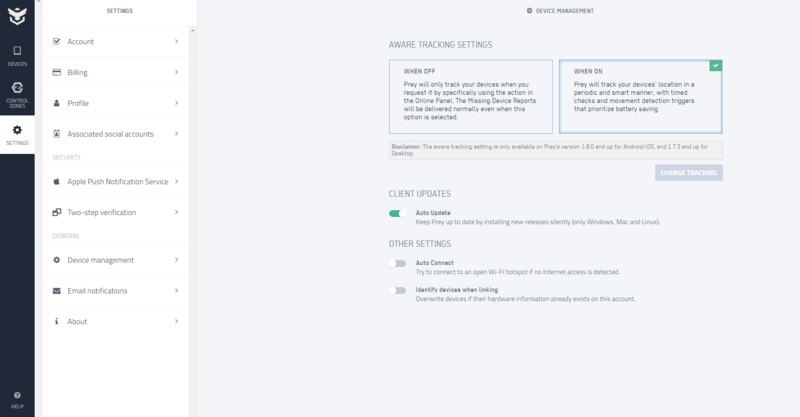 You can change how Prey tracks and find your devices' location by configuring the AWARE TRACKING SETTINGS. Turn the Aware tracking ON for smart & automatic tracking, or turn it OFF for a manual and on-demand tracking. By default, Prey's Aware Tracking is ON. Important: This setting doesn't affect how Missing Device Reports work. When you mark a device as missing, Prey will automatically gather and delivery evidence reports with its location, pictures, and more until it is recovered. WHEN ON: Prey will actively search and track your laptops, mobiles, and tablets to show their latest location in the panel. It will do so with periodic and timed locations checks, as well as with movement-triggered checks. This smart process prioritizes battery saving. WHEN OFF: Prey will only track your devices when you ask it to by touching the update location button at the online panel. This means that until that moment, Prey will not follow your device's movement. Find the setting in the Device Management tab under the SETTINGS menu, on the left sidebar. 3. Wait for the setting to apply. Location preferences are the first step to a new Prey feature: the Location History. We are working to create a platform that organizes all the information your tracking beasts gather to create a timeline with historic locations reached by Prey. This means in the future, you will be able to look back and see where your device was at specific points of the day, or browse previously retrieved locations.